Blast from the past: originally published June 17th 2003. Next up is American Conquest from CDV. Not a big name in North America, but they’ve has a lot of European hits like Sudden Strike and Cossacks. American Conquest is a real time strategy game set in the Americas from the Spaniards arrival to American independence. This is a big game, with 42 missions and 12 nations or tribes to play. It provides some innovation, albeit slight. It’s a traditional real time strategy: collect resources, build a base, pump out troops and defeat your opponents. You have to mine wood, gold, iron, coal and stone to construct buildings and troops. There’s no real population limit, so pump out as many workers as possible and bring in the resources. Fighting has been tweaked to provide more realism: troop formations including officers, standard bearers and drummers give a structured feel to the game. Morale plays a huge role, as the enemy bears down on you and your weaker troops break and run away. Even better is the ever used resource system: the more shots your troops use, the more iron is consumed. When you run out of iron your troops can’t shoot anymore. Bigger units require more resources, comparing cannons to muskets. American Conquest is a game on a grand scale, and as such requires a lot of management. 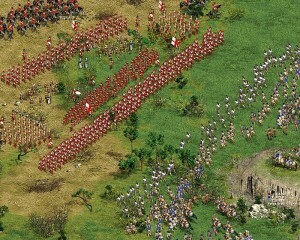 Computer opponents turn out troops at a ridiculous rate, flooding you in opposition. I think my mouse is worn out from all the clicking I did to build troops. I threw several thousand troops at an enemy base and still didn’t come close to any sort of victory. I stopped playing simply because the game required too much time and energy: I like a challenge but this is too much. Multiplayer is another story completely. I love this period of history and became engrossed in the options available in the game. 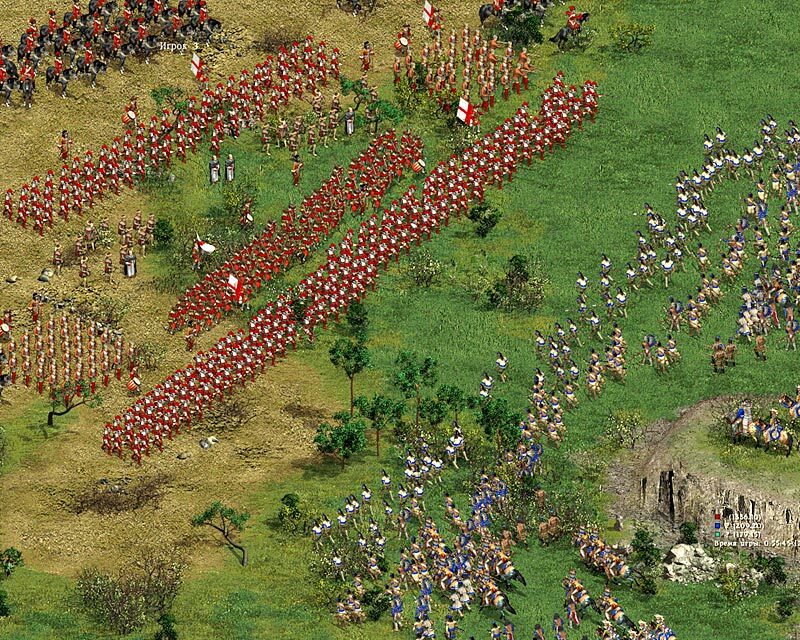 Human opponents are the best, and build troops and gather resources at a…human pace. A demo is available at www.americanconquest.de, so grab a copy and see for yourself. American Conquest is an engaging real time strategy, but illustrates why other games put a cap on units and resources. This article originally appeared in L.A.I.D. Magazine May 2003 issue.